Teaching your baby how to swim is an essential life skill and the confidence your little one gains in water through swimming lessons is priceless, not mentioning seeing your baby enjoying the serenity in water. Learning how to swim should be the one of the first skills taught to any baby. At Smile Swimmers, we have a specialised baby swimming lessons customised for infants aged between 3 to 12 months old. The aim is to learn how to teach your baby how to hold their breathe with a cue when going underwater. Q: What is the minimum age to start for your baby swimming classes? A: Babies can enrol to our baby swimming lessons as early as 3 months old. Q: Is it safe for babies to be swimming in chlorinated pool? A: Yes, definitely. The public pools are clean and well maintained by Singapore Sports Council. They are also regularly checked by National Environment Agency of Singapore (NEA). Babies are safe to be in chlorinated pool unless your child has any serious medical conditions and sensitive skin. If this is so, you might want to consult a medical professional prior to registration. Q: Must I be present in the water with my baby during the classes? A: Yes, at least one parent have to be in the water with your baby during the lesson. This is to help you pick up the necessary knowledge that can help your baby practice it afterwards. Most importantly, this is a wonderful opportunity to spend time and bond with your baby. This will help to calm your baby down and reduce separation anxiety at the same time. 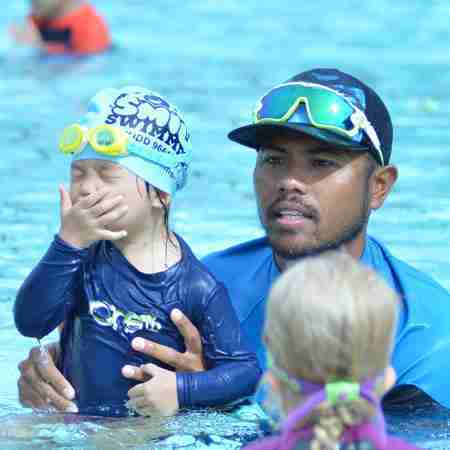 Q: Why your swimming lessons for babies are so short? A: Each lesson for our baby swimming classes last for 30 minutes. The duration of baby swimming class is kept short to cater to the shorter attention span of babies. This also keeps them excited and look forward for more lessons. A: Each class will only have a maximum of 10 babies. In certain classes/locations that have higher demand, there will be up to 12 babies per class. Q: Should my baby have their vaccination first before their first contact with the pool? A: No, it is not required. In fact, baby can swim even before their vaccination. Thousands of babies around the world have been swimming before their vaccination and did not experience any harmful effects. Q: Is the coach certified? Yes, Coach Kidd is certified with Diploma in Baby Swimming AUSTSWIM Infant & Preschool Aquatics. He is also a swimming coach accredited by local authorities with decades of experience of specialised coaching for baby swimming lessons under his belt. Q: Can both parents join during the swimming lessons? A: Due to the popular demand, our slots are fully taken up within a short period of time, however, we do have a waiting list and we do encourage you to put your name down and we will get back to you whenever we have slots opened up for your baby. Q: When is the underwater photography sessions? Q: When should I feed my baby? Q: Is there changing facilities? A: Our classes are mostly held at public pools. Some of the pools do have tiny changing rooms, most venues have shower facilities, without water heater. It is encouraged that it will be better if you could rinse up before heading back home. Q: What does my baby need to wear for the swimming lessons? A: All baby must wear a disposable or reusable swim nappy underneath.